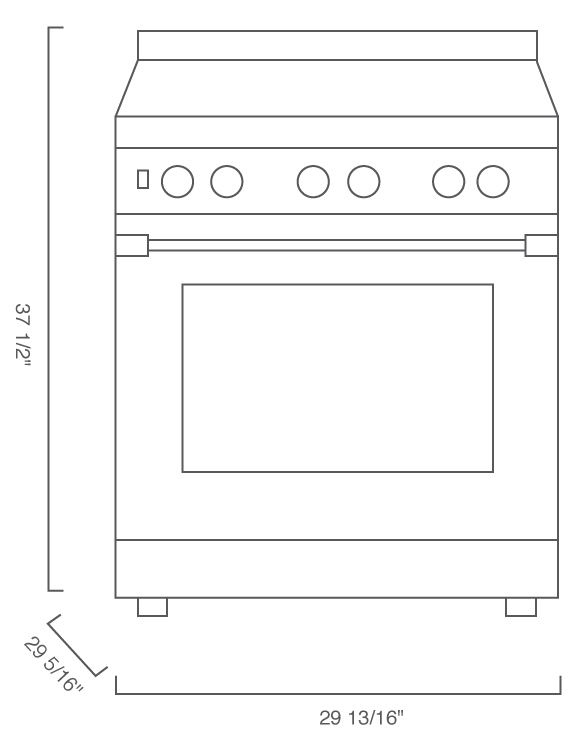 30" Pro Induction Range, 5.7 cu-ft, Self-clean, Convection, 4 burners with XL zone burner, Bull nose lighting, Stainless. Blomberg’s advanced convection system features an additional dedicated heating element around the cooking fan to circulate warm air evenly, creating a three-dimensional cooking effect that works consistently on every rack. Roasts and casseroles cook faster and more uniformly. Baked goods are evenly browned and beautiful. Multiple dishes cook to perfection at the same time with no mixing of flavors or aromas. Time is the ultimate luxury, and Blomberg ranges protect yours with high-tech programmable self-cleaning oven technology that lets you set exactly the right cycle. Set it for three hours, four hours, or five hours depending on the level of cleaning required. There’s no need to scrub hard-to-reach surfaces, scrape up stubborn spills, or use harsh chemicals. At the end of the cycle, simply wipe away ash with a cloth. 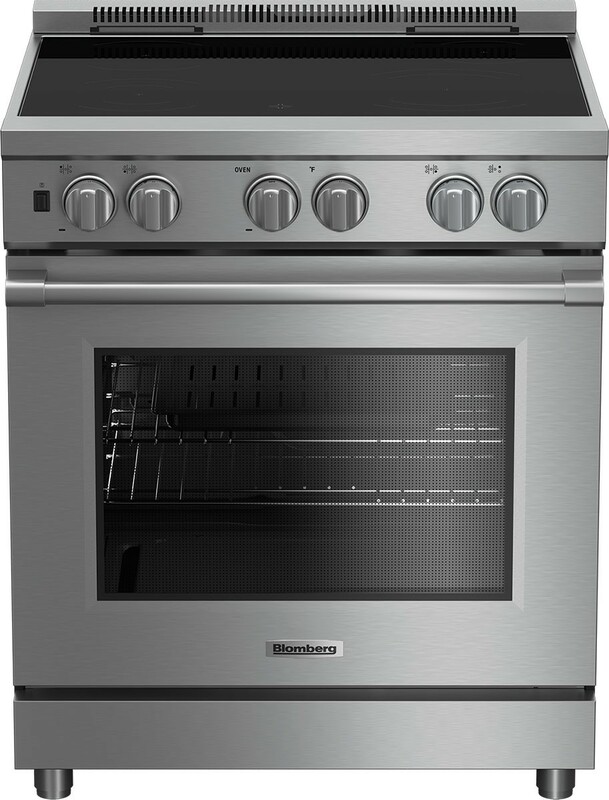 Industry Leading Oven Capacity 5.7 cu.-ft.
Blomberg knows you can never have too much room in your oven, especially when you’re entertaining. That’s why we feature the largest oven capacity available in a 30-inch range, with 5.7 cu. ft. of cooking space to accommodate everything from holiday roasts to full-size commercial baking sheets. Dual interior lights and a large viewing window make it easy to monitor what’s cooking. Blomberg electric ranges with sleek solid-surface cooktops offer more than a beautiful appearance and the benefit of effortless cleanup. They feature the versatile advantage of allowing you to create an extra-large, 11" cooking zone for fast, efficient cooking in oversize pots and pans of any shape, as well as with stovetop griddles. Always in step with the latest advances, Blomberg offers home cooks the innovative advantages of induction cooking. Preferred by many professionals, induction uses an electromagnetic field below a smooth, easy-clean glass cooktop surface to generate heat directly within the cookware (requires induction-capable steel pots and pans). Faster than radiant heat, induction cooks foods quickly and evenly and offers precise simmering. Once the pan is removed, the cooking zone instantly cools down, making this method extremely safe and energy efficient. Elegant European design features attractive LED lights under the bullnose that illuminate the controls and programmable electronic timer. 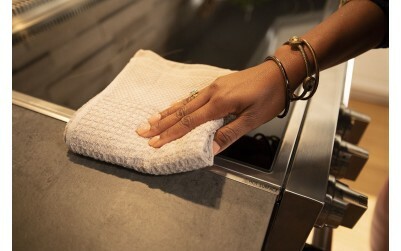 Blomberg ranges feature cool-touch glass on the oven door to prevent accidental burns and safely protect those small, curious fingers tempted to point out the cookie they want first! For easy combo-cooking or baking more than one tray of homemade cookies at a time, our oven features three heavy-duty wire racks. Each one is built to handle everything from feather-light soufflés to hearty holiday roasts that feed a crowd. Blomberg has designed its oven rack system to provide ergonomic, easy, and accident-proof access to whatever you’re cooking. The telescopic shelf system with extending arms allows full rack extension, so even heavy casseroles or roasting pans glide out without effort, while an integrated stop mechanism guarantees your safety. Height includes 1 1/2 for back guard._x000D_Depth includes knobs and handle. Net Capacity cu. ft. 5.7 cu. ft. Required cutout dim (H x W x D) (in) 36" x 30" x 25 1/2"